Waltheria indica with its soft little yellow flowers and zig-zag-edged leaves, can be pruned into an attractive, bushy and hardy pot plant. Waltheria indica is an erect to spreading shrublet, which is usually 300 mm to 1 m tall. The thin stems, as well as the rest of the plant, are covered with star-shaped and simple hairs. The egg-shaped leaves are greyish green and have a soft zig-zag edge, with a pointed to round tip. The flowers appear throughout the year and are clustered together between the leaves and stems. The flowers have 3 bracts and a cup-like, green (becoming brown with age) calyx with 5 yellow petals, which are fused together at their base and turn reddish brown at maturity. The fruits are small, 1-seeded capsules and sit in the calyx cup until becoming brown and dry. These perennial plants are quite hardy and spread easily. Waltheria indica is a widespread species and, according to the Red List of South African plants, has a conservation status of Least Concern (LC). Waltheria indica is found mostly in the northern part of South Africa, extending into Namibia and Botswana and tropical Africa. It is also found in the tropics and subtropics of the old and new worlds. It grows in most habitats, including open grasslands or woodlands, rocky slopes and along rivers, and can be found in human-disturbed areas in sandy soils. Waltheria indica is the only species in the genus which is distributed in southern Africa. This species is quite distinct from other species of Malvaceae in having a 1-locule ovary, whereas the other genera have 2 or more locules. The genus name Waltheria, was used to honour the German anatomist, botanist and physician Augustin Friedrich Walther (1688–1746). The specific epithet indica associates the species with India. The tiny yellow flowers seem to attract different flying insects, such as bees. The 1-seeded capsules dry out and become brown, and will germinate in suitable moist soil, once they have fallen. The leaves of Waltheria indica are used as a leafy vegetable by the Vavhenda people of South Africa and the plant is used for barrenness by Shangaan woman. 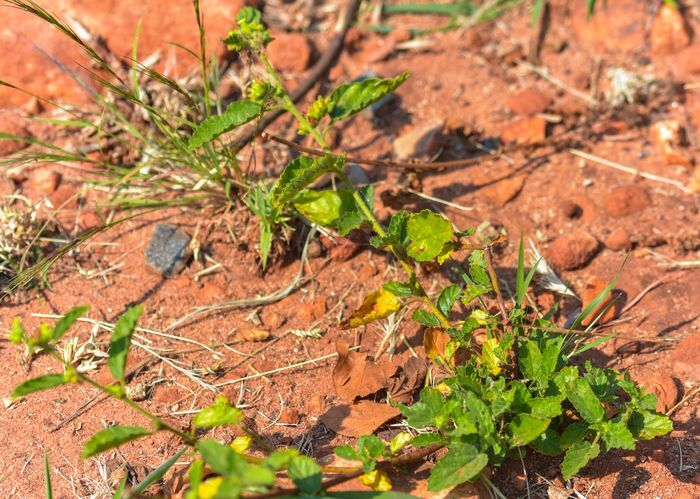 The roots, leaves and whole plant have been used to combat sexually transmitted infections, urinary tract infections, and a variety of infant illnesses in Limpopo. Because of its spreading nature, Waltheria indica makes an ideal pot plant. Waltheria indica has a spreading nature and can be found growing in small patches in full sun. The plant is more attractive in a pot where it can be pruned to become bushy. Collect the 1-seeded capsules before they turn completely brown and let them dry before sifting out the seeds. The seeds will take 1 to 3 months to germinate in a damp planting mix and the seedlings can thrive in a variety of soils. Foden, W. & Potter, L. 2005. Waltheria indica L. National Assessment: Red List of South African plants version 2017.1. Accessed on 2018/07/09. Mongalo N.I., Opoku A.R. & Zobolo A.M. 2012. Antibacterial and antioxidant activity of the extracts of Waltheria indica Linn. collected from Capricorn District, Limpopo Province, South Africa. Journal of Medicinal Plants Research 6(43): 5593–5598. Verdoorn I.C. 1981. The genus Waltheria in southern Africa. Bothalia 13, 3&4: 275, 276.